Among the highlights of my time at Brock are all the practical experiments I have performed in Biology and Chemistry. What’s more, trips to Oxford and Cambridge universities and visits from university lectures and medical professionals have really helped me to make up my mind about studying Medicine. 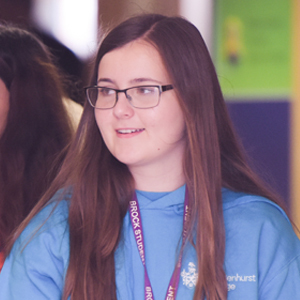 I chose Brockenhurst College because of its good reputation, plus I wanted the added freedom of going to College as opposed to school. I also liked the Science Department’s facilities and the structure of the courses. I’ve always wanted to go into Medicine and Brock has an Extended Project Qualification (EPQ) in Medicine. In addition, it has the ‘Medical Matters’ Enrichment opportunity, which gave me a lot of extra information and insights. Among the highlights of my time at Brock are all the practical experiments I have performed in Biology and Chemistry. In Psychology we did a full research project, which really brought the subject to life. What’s more, trips to Oxford and Cambridge universities and visits from university lectures and medical professionals have really helped me to make up my mind about studying Medicine. Being part of the Student Ambassador team helped me to grow in confidence, especially when talking to groups of people.